ATC Tonneau Covers are competitively priced fiberglass truck bed covers. 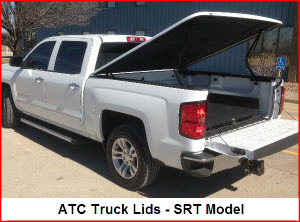 ATC SRT Model Truck Lid (tonneau cover) has the lowest profile of any tonneau cover in the industry. 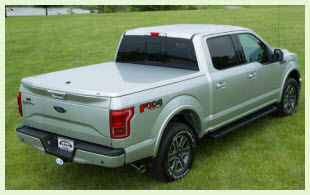 ATC Tonneau Covers or truck lids as the people at ATC Truck Covers call their hard fiberglass truck bed covers come in four different models; the Classic Lid, the Platinum Lid, the Wrap Lid and the SRT Lid. ATC manufactures these lids at their 90,000 square foot facility in Ottawa, Kansas right outside of Kansas City. The 85 or so employees that work at ATC also make the ATC Truck Cap line just in case a tonneau cover doesn't satisfy your needs. Small variations in standard features and options account for the different version names. All versions are made of durable hand laid fiberglass, use a frontal 4 bar pin hinge system with struts to open and close and come with a Limited Lifetime Warranty. If that isn’t enough you get a lid custom fit for your pickup, a drill-less installation and a single lock assembly to secure the lid. Remember, as with many hard fiberglass tonneau covers it usually takes two people to install lids this heavy. So it’s usually a good idea to have an authorized dealer install this kind of truck bed cover. 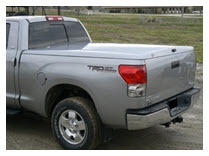 OK, here’s some features and options of these ATC Tonneau Covers. Manufacturer : ATC Truck Covers Inc.
Cover Weight : Approx 100+ lbs. Both tonneau covers and truck caps secure the truck bed area and slow the flow of air. This sometimes causes a buildup of moisture in the truck bed area that can result in mold, mildew, smells and aggravation. Universal absorbent mat protectors help prevent this situation from occurring and make cleanup a snap.